Kick back and relax to some good tunes, cold brews, and tasty ‘que at the fourth-annual Music, Dance, n’ Que Festival. Hear live bluegrass from the Myers Park High School Bluegrass Club, The High Ridge Pickers, and nationally-recognized musician David Childers. Enjoy bites and brews from OooWee BBQ, Olde Mecklenburg Brewery, and Cupcake Delirium. Play games, make crafts, browse vendor stalls, and buy tickets for the raffle that will help fund our support group for the coming year. Join members of the Mecklenburg Declaration of Independence Chapter of the Daughters of the American Revolution as they share the fascinating story of one of their founding regents. Alexander is a fascinating character who was among the first North Carolina women to enter the professional class and, later, politics. Julia was a descendant of some of the key founding fathers of Charlotte and her father was also a well-known politician who served in both the state and national legislature. Join historic re-enactor Mia Dappert to learn about the time-honored tradition of the cross stitch sampler. Young girls would make samplers to practice both their stitching and literacy skills. During this workshop you'll learn the same basics of cross-stitch and walk away with a custom Polk-inspired sampler to complete at home. All workshop materials will be provided. Pre-registration is required. $15 per person + tax. | Click here to register. Hone your basket weaving skills with a slightly more complex D-handle basket. Susan Worchester will guide you through the pattern and techniques required to create this useful and beautiful basket style. Participants will be supplied with the required reeds of varying sizes and colors to complete their project during the class. Pre-registration is required. $25 per person + tax. | Click here to register. Fiber Artist Laura Bain of Phun Knits will introduce students to the basic concepts of turning fiber into yarn during this workshop. Participants will receive a drop spindle and wool fiber to practice with during the class and then take home to continue honing their craft. Students who attended last year's workshop or already have a spindle are encouraged to join again at a discounted price to continue working on this fun and practical historic skill! Pre-registration is required. $20 + tax with spindle or $10 + tax without spindle | Click here to register. Historic re-enactor and avid seamstress Colleen Pappas will teach you 18th century sewing techniques and stitches. 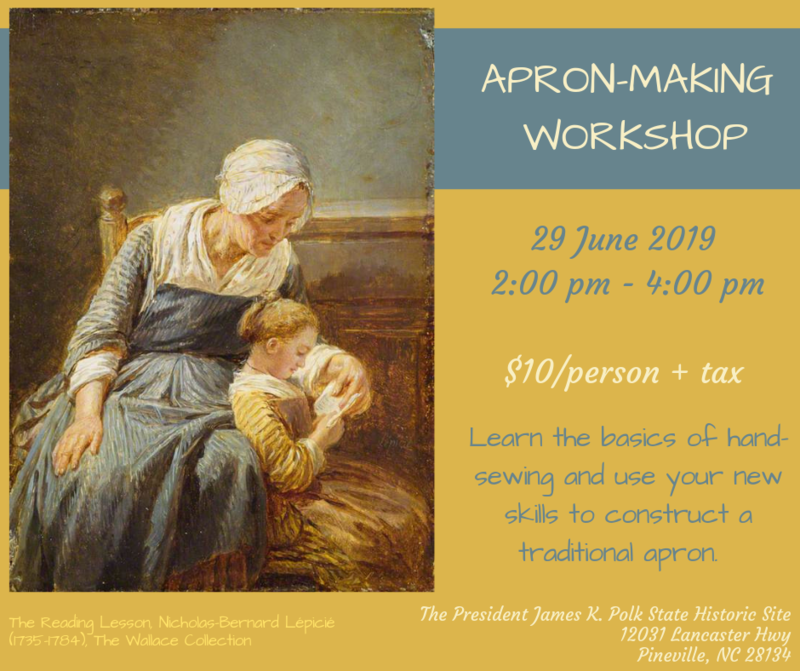 Then you will put your new skills to use creating an apron like those worn by women during the 18th and 19th centuries. All workshop materials will be provided. Pre-registration is required. $10 per person + tax. | Click here to register. From soldiers to society ladies, nearly everyone in 18th and 19th century society needed a cloth wallet to hold their sewing essentials as well as coins and other other notions. Come learn the basics of hand-stitching with our Assistant Site Director, Kate Moore, and walk away with a simple cloth wallet to hold your pins, needles, and more. The Tarheel Junior Historian Association is a group of clubs throughout North Carolina that promote a love of history. More than that, Junior Tarheels learn critical reading and writing skills, advocacy, volunteerism, art, videography, public speaking and more! Clubs are student-run, so join us and help steer the Young Hickory Explorers towards success in 2019 and beyond! Contact Kate Moore at kate.h.moore@ncdcr.gov or by phone at 704-889-7145 with any questions! Laura Bain of Phun Knits leads a weekly get-together of fiber lovers of all sorts. Those interested in either modern or historic fiber arts are welcome! Whether you knit or crochet; spend hours pouring over the many gorgeous yarn choices or hours spinning the wheel as your create your own yarn; follow a carefully laid-out cross stitch design or free hand an embroidery creation all your own, all fiber lovers are welcome! Please Note: Meetup members will not typically be in costume during meetings, though they would be happy to discuss historic fiber arts with any visitors who stop in. 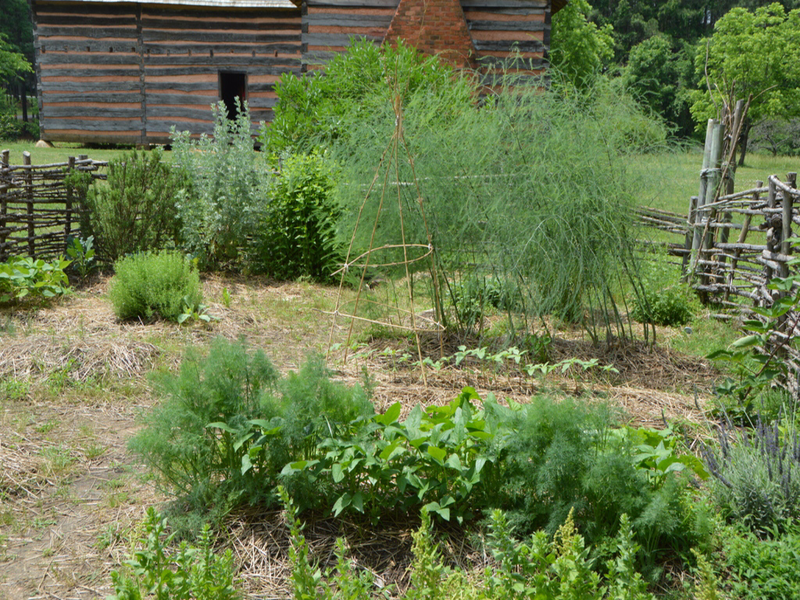 Members interested in historic spinning, dyeing, weaving, knitting, etc. will be encouraged to join Laura and staff members as they share their knowledge with school groups visiting the site. Period-appropriate clothing (1790s-1810) may be provided to those interested in the educational aspirations of the group. 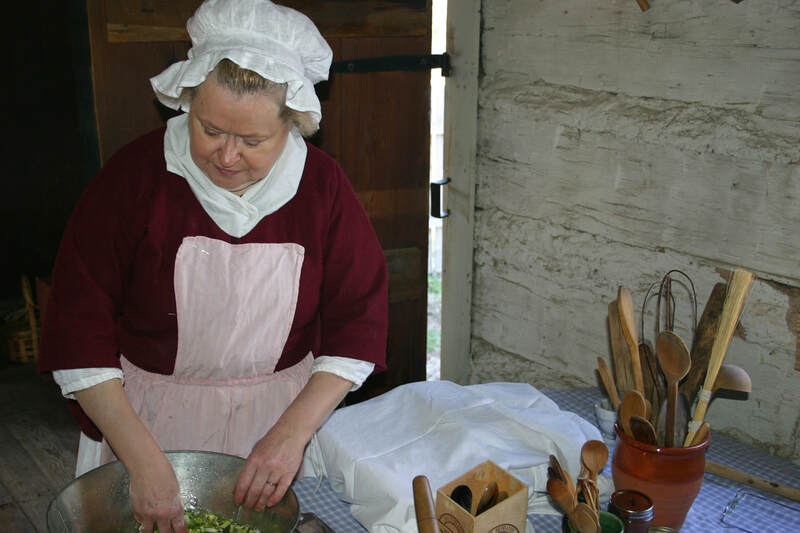 ﻿The Historical Cooking Guild of the Catawba Valley is at the site on the 2nd and 4th Thursday of each month, September through May. Use all your senses as you see, smell, and hear about what the average cook would have prepared during the time that James Polk was a boy. The ladies may simply be stoking the fire and researching "receipts" or they might be rendering some bear fat to use in a wide variety of dishes. You never know what you may see when you stop in, but it is sure to be a fascinating glimpse into a time gone by.